From the same data used for our latest Fiscal Fact, “New Census Data on Property Taxes on Homeowners,” which ranks more than 1,800 counties by real estate taxes paid, and real estate taxes paid as a percent of median income, we produce this map. The state data are available here. Because it is a highly visible tax, people often complain about property taxes. 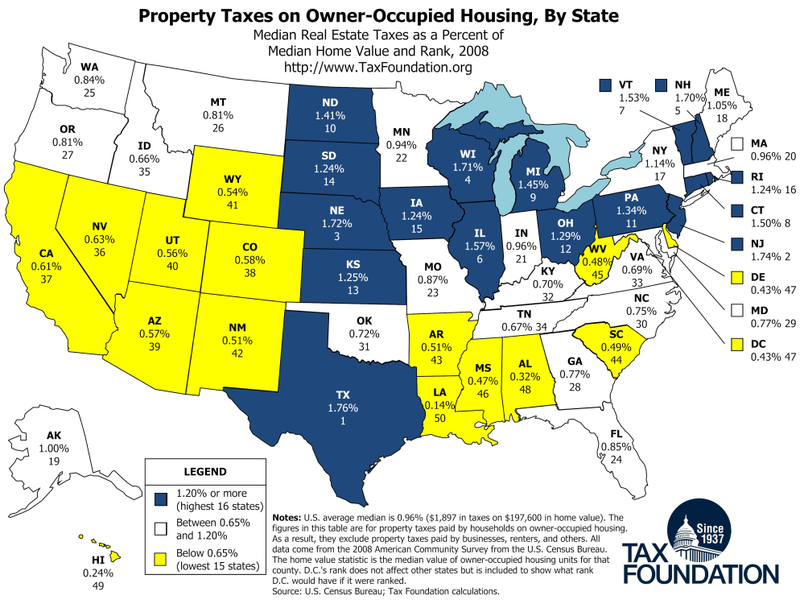 This map shows which states have relatively high and low real estate taxes as a percent of median home value. For states, the top three are Texas, Nebraska, and Wisconsin and the lowest three are Louisiana, Hawaii, and Alabama. The top county in the country is Orleans County, New York; the lowest, St. John the Baptist Parish, Louisiana.